and tired of gaining weight and not following a lifestyle you truly want? "I became so emotional and filled with shame and fear that I had a hard time sleeping because I'd wake up with gut rot from all of the crap I had eaten during the day. And then...last night at 2:30 in the morning I put in your Emotional Eating CD and it was like I was pulled out of the hole I had sucked myself into. I was able to forgive myself, let go, relax and step into my truth again. When I woke up this morning it wasn't a blur, "what can I splurge on this morning" kind of morning. I woke up with my self love and respect returned to me and I drank my glass of water, made my kale, apple, lime and carrot juice and approached the day with a renewed perspective." 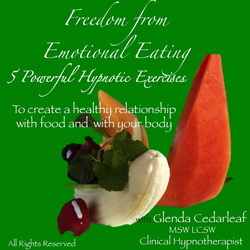 "Freedom from Emotional Eating Part II"
Inspiration and tools to help you transform patterns of emotional eating…. To help you explore and reinforce your decision to make these changes in your life. and then transform emotional eating. This track helps you reinforce your ability to sleep deeply and restoratively, a key ingredient in staying healthy and fit. Powerful reminders for caring for your body mind and spirit. This is the one track that can safely be listened to when exercising or driving . Her audios Healing Surgery is sold at the Mayo Clinic Medical Store. 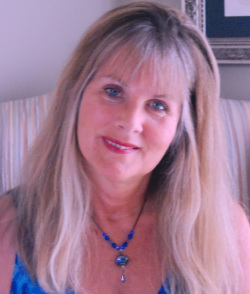 Contact Glenda for reduced rates for bulk purchases and affiliate sales partnerships and licensing to hospitals.